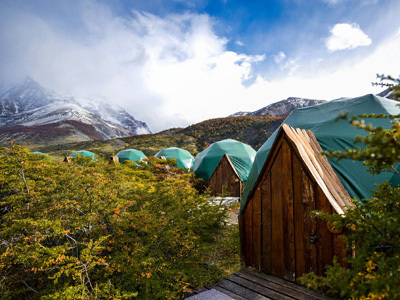 Your journey today begins, as you are picked up from Punta Arenas airport in the morning and driven to EcoCamp Patagonia, located in the world-famous Torres del Paine National Park. En route, you will make a couple of stops in order to get the most out of the drive. First up, will be Puerto Natales, a small, lively town on the shores of "Seno de Ultima Esperanza", where you will sit down to enjoy a hearty local lunch. Next, will be Cueva de Milodon, a massive prehistoric cave where the remains of a giant ground sloth were discovered in the 1890’s. The journey is scenic and highly atmospheric, featuring many wild birds and wonderful Patagonian landscapes. 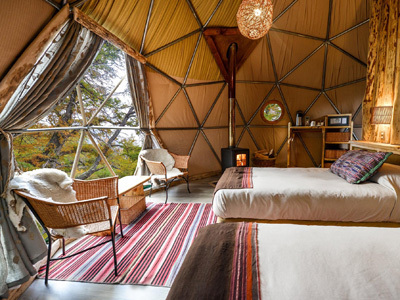 The day will come to an end as you arrive at the majestic EcoCamp Patagonia, for your overnight stay. 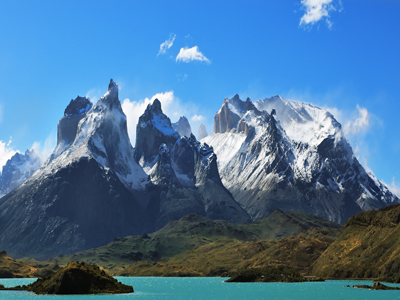 Nestled in the heart of Torres del Paine National Park and featuring a prime view of the majestic Torres, there is no better property you can experience the Chilean Patagonia from. Sunset is usually not until 11:00 PM during the summer months, meaning there should still be enough daylight for you to admire the Patagonian steppe with its guanacos and snow-peaked mountain horizon upon arrival. Following breakfast this morning, you will drive to Estancia Laguna Amarga, hop on a mountain bikes and pedal away towards the Laguna Azul campsite! The campsite is located approximately 20 km to the north east. 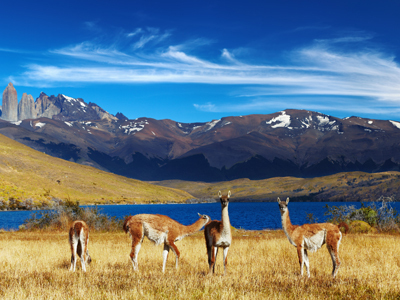 During this excursion, you will cycle past an array of fauna on the Patagonian plains, including: guanacos and ostrich-like ñandús and maybe even the occasional puma print! As you head north past the cascading Paine waterfall, you will stop to admire the stunning views from this incredible vantage point. From there, the journey continues past a small canyon in the middle of the Patagonian wilderness, before heading towards Laguna Azul. Upon arrival at Laguna Azul, you will enjoy a well deserved box lunch. After your feast and some time to rest, you will have some time to explore your surroundings and climb to a nearby scenic point with a panoramic view of the lagoon and the Torres in the distance. The cycle ride back to Ecocamp is optional - anyone who is tired after the journey and barbecue is welcome to travel back in the support van, which will be there to accompany the group at all times on the outward journey. Back at EcoCamp the cyclists will reunite with their Safari hiking counterparts to enjoy the evening aperitif. After breakfast at EcoCamp, you will head off at 7:30 am to the Serrano area in the western sector of the park arriving at around 9:00 am at Serrano Base. From here, you will board another vehicle and head to the Pingo River where you shall take part in a safety talk (20 minutes approx.). Afterward, it’s time to get into the water! 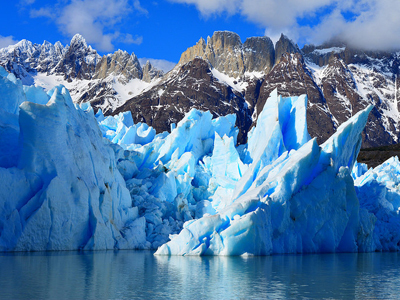 Once your kayaks are in, you will move gently with the river’s current towards the Grey Lake Peninsula to see the glacier’s impressive icebergs. After enjoying the moment, it’s time to continue down the Grey River for the next 3 hours approx. At Puente Grey, you stop to eat your boxed lunch before continuing downstream to the confluence of the Grey and Serrano rivers. Around 20 minutes later you return to where your adventure started, at Villa Serrano, after an amazing day on the water.? Then you take the van returning to EcoCamp for your evening aperitif and meal. 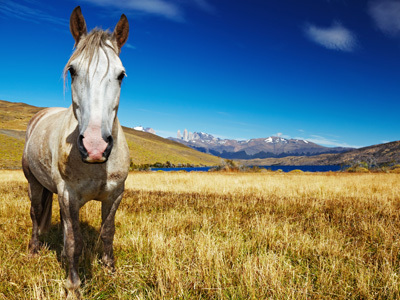 One of the best ways to enjoy all that Patagonia has to offer is by riding through it on horseback. This excursion begins at 9:30 AM, following a hearty morning breakfast at EcoCamp. Get ready to admire the most spectacular parts of Paine hill on this full day horseback riding excursion. Venturing through forest and crossing streams, all the while surrounded by amazing greenery. There are five different prairies along this tour and experienced riders are welcome to gallop through these parts at their leisure. If you visit in February, you will be able see the Encantado valley. Lunch will be served at the Seron campsite, where you will be rewarded with a spectacular view, featuring parts of las Torres, Mount Admiral Nieto, the Blue lagoon and the Paine river. Depending on the group, you can decide to stay out riding past 4:00 PM or choose to head back early to EcoCamp to sip on an evening cocktail and relax. You leave after a tasty breakfast at EcoCamp to head to Cerro Paine, a nearby mountain characterized by its two imposing peaks. You hike along the mountain for half an hour, which allows you to warm up while admiring the view of the surrounding pampas. The challenge begins as you start climbing the eastern part of Cerro Paine. You cross the lenga forest with the sound of the local birds and enjoy a few stops to observe the immense Almirante Nieto Mountain and its glacier on your left side. With any luck, you will follow the tracks of the puma as the towers come into full view. A nice place for lunch, isn’t it? As you are ready to start the steepest part of the hike, you leave the forest and hike on the rock. As you go up, you admire the spectacular panoramic view of the immense pampas and the mountains in the distance, like the Balmaceda Mountain. You walk upward for about an hour up to 1500m/4920ft to reach the eastern peak of Cerro Paine, which offers an unforgettable view of the towers and the Ascencio Valley. After chilling and taking in one of the most striking vistas of the national park, you backtrack along the same trail and return to EcoCamp for a well deserved dinner and rest. Early this morning, you will board the transfer vehicle for the scenic ride back to Punta Arenas. Sit back, relax and savor every last bit of the impressive views, until you are dropped off at the airport in good time to catch your evening flight to Santiago.